take off of the project. next academy to be established in Africa. the value of sportsmanship. We share the same values with FC Barcelona which are respect, courage, humility, social integration and community service. blessing; you have our go ahead. African Nations Cup in Lagos, which will hold between December 10 and 23, 2016.
to them so far in actualizing the project. 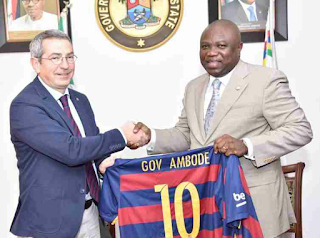 establish its Academy in Lagos due to the impressive population of the state, and the opportunity to share the philosophy of the team with the state. He said players like Messi, Iniesta, Sergio Busquet, Pique, among others, all started from such Academy, and that the club has a unique methodology of instilling great virtues in footballers, apart from footballing skills and education. 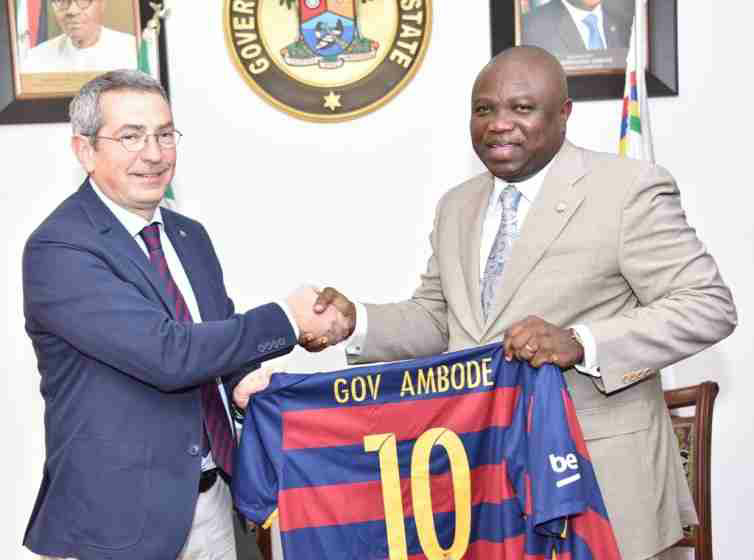 Pinnick congratulated Governor Ambode over the successful hosting of the Lagos International Marathon, saying it was one of the most successful tournaments in the world. He pledged the support of the Federation to ensure the success of the Academy, especially in terms of facilitating the necessary approvals needed for expeditious take off of the project. African Football (CAF) had just approved the hosting of the first ever Beach Soccer African Nations Cup in Lagos in December.